t*rexes and tiaras: Friday Favourites 113.. This week's wishlist is in response to my being in a bit lot of a panic. I'm off to a spa for a couple of days next week - a lovely treat, you'd think (and I do agree, it's a really nice gift to have received), but it's put me in a total panic. It's nothing new that I have absolutely no body confidence at all. I'm not convinced that this stress and panic is outweighing the relaxation that I should feel when we get there, as I'm really not convinced I can be there, in a swimsuit, relaxing. Those things just don't go hand in hand for me, so much so that I turned down a holiday earlier in the year because I knew I'd have to wear a swimsuit and I knew I wouldn't be able to do it. I swim, functionally, most days. I do have to wear a swimsuit for this, of course. It's a faded, stretched and tatty navy one and I'm not sure it's the sort of thing you wear to a spa day. It doesn't really fit me anymore, due to the stretch, but it's still in one piece, so I make do with it at the moment because of how much swimwear shopping stresses me out. I manage to do the swimsuit thing at my normal gym because it's usually very early morning, and there's generally nobody else there. Plus, it's a short shuffle from the changing room to the pool steps, so I can get in, arms crossed in front of my horrible body, without anyone having to see me. I know that retro shapes are considered the most flattering for curvy folk. I have more curves than I would like to admit around my hips, bum and thighs. I'm also not a huge fan of my stomach, despite the hundreds of crunches and sit ups I do every week. So it's likely that even though the bikinis are the prettiest, in my opinion (that For Luna one is beautiful) that I'll be going with a full swimsuit - in fact, I'm glad that I've just spotted this polka dot Miraclesuit one; Simply Beach might have saved the day again! What tips do you have for buying swimwear? What would you wear to a spa day? I'm not even convinced I'm brave enough to go. Lovely swimsuit choices Char. I know it's hard for anybody to gain a rational sense of perspective about their own body as we always focus on our own insecurities but please know that from an outside perspective, you are in great shape. You're slim and you look great, your figure isn't horrible at all. You look after yourself by exercising and it's admirable, I wish I did that. I know of course body image is incredibly personal so those comments won't make you feel more comfortable but I just wanted to say because it would feel wrong not to. I am going to try to go, even if I just take my horrid baggy gym swimsuit. I think it would do me good to relax and get away from work for a couple of days as I've been so incredibly stressed out lately. I love the green motel one! My tip, try them on. I always think that I'm going to look far worse in swimwear than I actually do. As long as it's a good fit, you'll be fine. I wish you could see what a lovely figure you have and that you could be happy in your own skin. Good luck, hope you find one you're really happy with. Thank you, I've tried a few suits on now but I'm not sure that it's helping. The green print one is a favourite - or maybe the yellow - both? Hannah's comment above is so beautiful and sums it up - if you feel up to it, go, and you'll have a fantastic time. I tried the green and yellow on but have sent them both back - not flattering!! I really like the polka dot bikini - I tried it on and it's not perfect but I think it's the best I've tried, so it's a possibility. I hate low cut stuff. My black polka dot one is great as it's a bit more of a swimdress so covers my bum etc up. Have you considered a swim dress? I've not seen any swim dresses, but will definitely have a look as that sounds like it could be the answer. I'm sorry you're feeling so worried about the spa day. I've never been to a spa (well, I went for a pedicure in one once), but I've been so self-conscious and embarrassed about wearing a bathing suit in public for as long as I can remember, to the point the fear has made me sick to my stomach. I can totally get how you must be feeling and it's horrible feeling like that. I just wanted to say that you really have a gorgeous figure; it's not horrible at all! You're slim, you're in proportion, and you have legs to die for! You always look lovely! I know how hard it is to believe compliments from others when you hate what you see in the mirror, but honestly, you look amazing! When you're at the spa, you should be able to control how much of your body is on show, and choose the treatments which you're most comfortable with having. You should be able to cover up in a robe for many of them. Hopefully you'll be having such a good time with friends that you'll be able to relax and feel at ease. Don't do anything you're really not comfortable with, but also remember your friends are likely to be worrying about their body hang-ups, too! Almost all women do, and we just don't realise it. I love the polka dot one -piece but it's a little out of my budget. I'll keep looking, though! I think you have a lovely figure, based on the photos you post here. 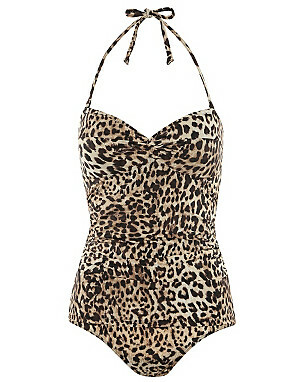 A retro style one piece is probably a good idea, or maybe a tankini? Or, I saw a girl recently wearing a beautiful bikini with the most amazing high waisted bottoms. They literally came up to her belly button, thus covering her tummy, but they have her a fabulous hourglass shape because she had hips. And she had twins that looked about 2 or 3 months old, so I bet she was feeling less than confident, yet she looked amazing. I wish I'd been brave enough to ask her where she got it. As Hannah says above though, most of the time you'll be swaddled in a robe. I have done spa days and never seen anyone lounging in just their swimwear. Go for treatments such as manis and pedis, or facials, if you are uncomfortable with massages, and avoid the sauna, but use the jacuzzi and pool. Oh, a tankini might be a good idea. I've been looking for some longer retro suits, with the slight legs in them, i used to have one and it hid the top of my thighs which was helpful. Get the asos yellow one! It's gorgeous. They're all lovely, I'd go for a swimsuit rather than bikini if you're self conscious of your tummy and you'll possibly get more wear out of it. I'm just gearing up to start back at physio, had to shave my legs for the first time in months today! Have NOTHING to wear, so it's going to have to be comfy dress and leggings...not got anything flat for my feet! Dreading it.